Well what a day and what a weekend. I’m not sure I can get across the way I felt during the morning. I will say that at one point I just had to sit down and take it all in. I remember Andrea asking if I was okay – in fact several of them did. Of course I was fine but with things happening so fast I felt there was a need to sit and enjoy. I’d arrived in London on the Friday night, after work. In an amazing fluke Mrs E had booked the hotel across the road from the Asics store – so in theory I could roll out of bed at 8:51 and be over there in time for the meeting. I didn’t do that of course. I woke at 6:45!!! So I walked over to the store. The first person I met outside was Isabel. Photo time and we took some snaps outside the shop. From the front it looks quite small but like the Tardis it’s bigger on the inside. Roger arrived next and after trying to explain to the cleaner that we were there for Runners World we were finally let in through the side door. It’s when you enter the store do you realise how big it is. We were taken downstairs into a room to meet everyone. Andrea, Gemma and Katie from Runner’s World were there and Claire from Asics. Tom the photographer was also there and kept popping up like a silent assassin at different times of the morning. I was later told (I think) that the apparel on display in this room was for the new season and not released yet. There were croissants and pastries waiting for us but I didn’t have any. I wasn’t hungry and still a bit in awe of what was happening. 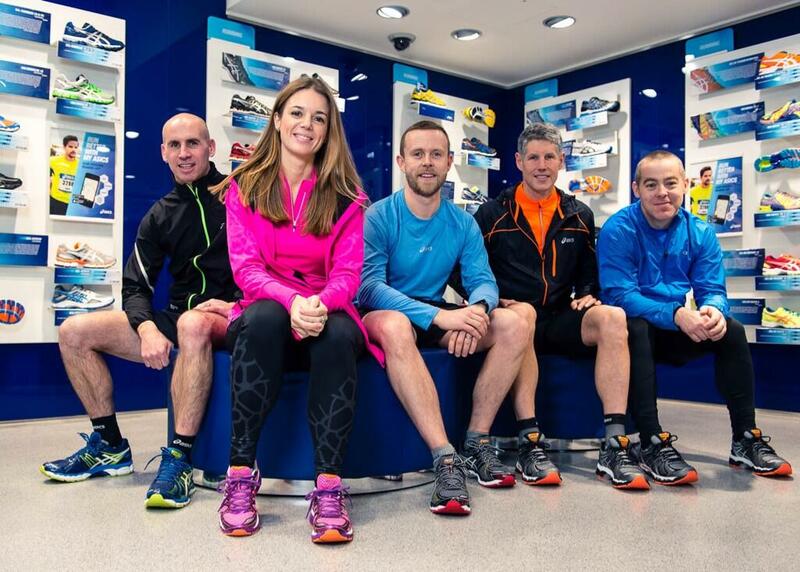 It was explained to us how the morning would go – apparel, gait analysis and a body composition analysis – all courtesy of Asics and Runners World. So up we go to the shop floor, a full 30 minutes before the store opened. We owned the store. I immediately liked the blue kit – and this is what I stuck with. I’ll post pictures of what I had later in the week as it’s a bit late in the evening now but I am extremely happy with everything. All blue and black. Quality stuff. What I did find amusing was the variety of sizes I needed to feel good. Running tights in medium, running tops in XL, shorts in L. Funny. It was actually quite tough deciding what to have. The budget had been set and I felt I had to spend it wisely. Eventually I sorted it all but left a fair chunk of the budget as I didn’t know what trainers I was going to have. This part of the morning was led by Libby. As a Computer Science and Technology teacher I was in awe at the tech being used to analyse our feet. I’d had gait before and knew I was a neutral shoe but never before had someone spent so long looking at my feet. A 3D foot scan showed my right foot was a full 10mm wider at the front than my left foot. Freak! I discovered that I have flat feet and my right foot leans out when I run. It also points in. As I watched the video I was surprised that I have never clipped my left leg and tripped up when running. Libby and I discussed my current trainers and the difference in sizes. I currently run in a Saucony Size 8 but also run off road in a pair of Adidas Kanadia in size 9.5 (which are tight). 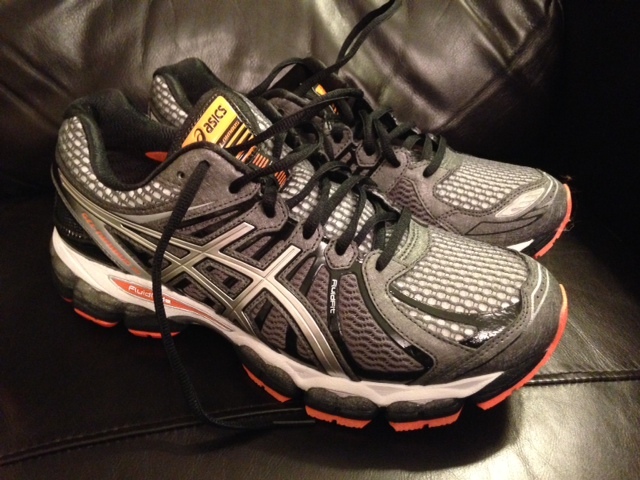 As it happens Asics have trainers in different width fittings so I was advised to try the Gel Nimbus 15. Wow – what a fit – the best pair of trainers I’ve ever tried on. What is interesting is the size. We found that a size 7.5 was good enough for me. Over the past two years since I started running I’ve lost two stone so I was extremely interested to see how the professionals would measure my body make up. I was extremely happy with the results although I would have liked to be a bit lighter. The Segmental Analysis had me above average muscle mass rating for a man of my age and height and a fat rating of below. I was very happy with those readings. I am concerned at a rating of 7 for my visceral fat. This needs lowering – and I will do it. My right leg is heavier than my left leg but my arms are the same weight. It will be interesting if Runners World can get us back to the store after the marathon to have our stats measured again. Once all the readings were collected and as the morning started drawing to an end it was time to catch up with Sam Murphy – my coach for the next 4 months. We talked about my schedule and how my days worked out. We discussed whether I could keep an aspect of circuit training in my weekly routine. Sam also gave me a worksheet of stretches that I need to complete this week and report back to her when I’ve done them. Sam outlined that she would email me the plan and I would move on from there. A quick photo and that was it. Of she went into the busy Oxford Street. The end of the morning was spent with Tom the photographer. Every angle was shot, snapped and captured. It was an amazing day – I was in awe. It was one of those days that happens to someone else and you hear about. I never thought it would happen to me. 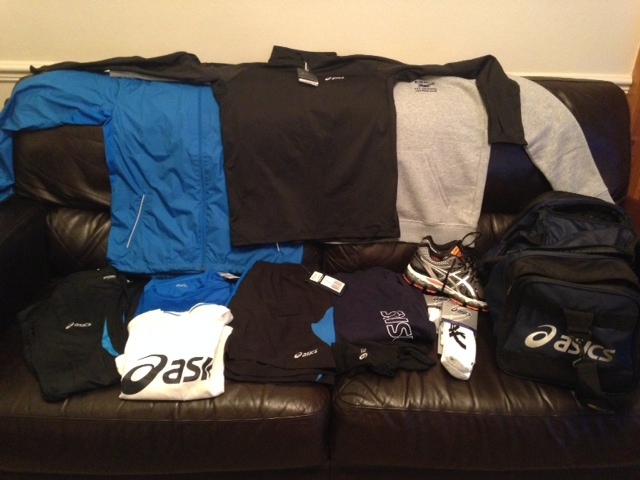 Now the kit is in place, the coach is on board – it’s time for me to deliver the goods.